Here's a little of what I have been working on this week. These blocks are a traditional design and are called Philadelphia Pavement. 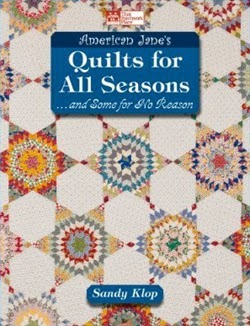 My inspiration and pattern guide has very much come from the book American Jane's Quilts for All Seasons: and Some for No Reason by Sandy Klop. 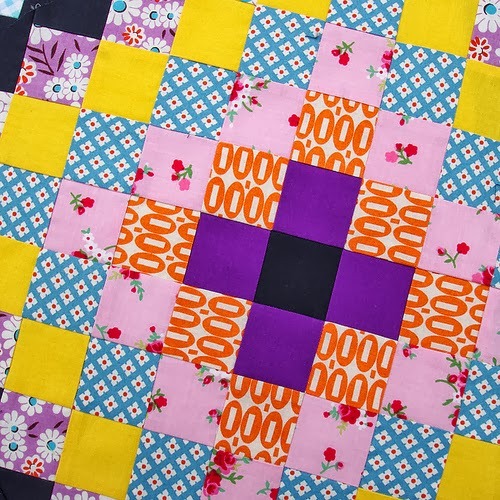 This book includes a clever strip piecing pattern for this block (and features a beautiful quilt with these blocks set on-point) for fairly simple block construction (not unlike that of the Scrappy Trip Along Quilt). I have made a few minor pattern modifications so that I could be happy with the final seam allowances but that was just to satisfy my own sewing peculiarity. 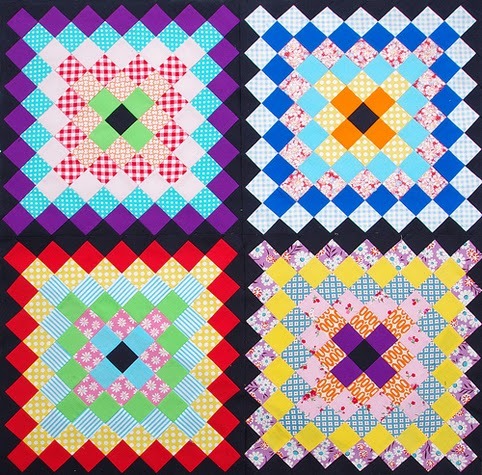 The squares are small, finishing at just 1.5 inches x 1.5 inches - each block measures 15.5 inches x 15.5 inches. I haven't yet sewn any blocks together and I have a feeling it might be the trickiest part with bias edges and lots lots of points to match. But I'll push on and make more blocks. One step at the time. Love your mix of solids and prints, and that purple makes me a convert! looks so classic in modern way , beautiful as always ..
Gorgeous, as always, and your perfect piecing just inspires me! Oh, Rita!! I love it when you work with white, but I go MAD WILD when you bust out the black! These are completely amazing, and (as always) absurdly inspiring. Thanks for being awesome! great quilt, as always. for sewing the blocks together why don't you glue baste them, its much easier than pinning, and will hold the bias. just a thought. What a great pattern and as usual your fabric choices are fabulous. Your combination of prints and solids really make this block extra wonderful! I love the black. Really sets off the colours! Wow! Looks great, such small squares of fabric and yet such perfect seams! Can't wait to see the finished quilt! Oh my, these are gorgeous! The black is brilliant!!! One more way to use squares. Each is a little mini quilt. I just have to take my hat off to you and your talent! 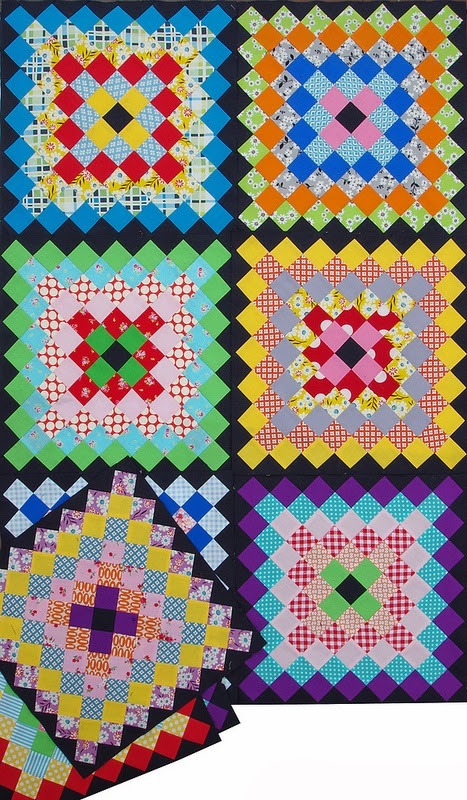 That is amazing..and I dont' like "scrap" quilts! But this is gorgeous! I could never put something like this together! Good grief, even the picture of it is beautiful! 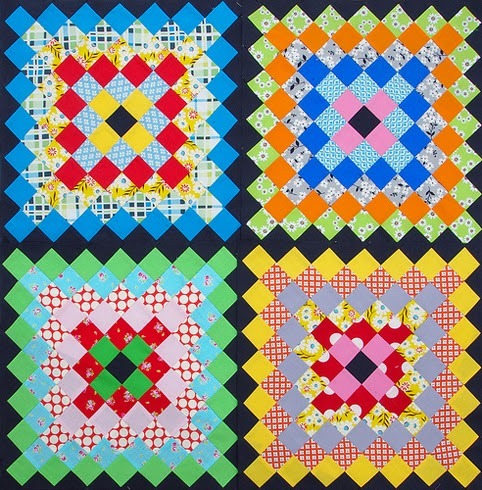 The blocks look like a grown-up, sophisticated version of the granny's block. Very nice! Thank you for sharing. You had me at Philadelphia, then cemented it with American Jane. Love the blocks--I can't wait to see more!